Sometimes those challenges that are meant to be easiest just are not - not at all - this may be a fail - I haven't decided yet. I used just 2 polishes for this, and some loose glitter I bought on eBay last year. I use glitter a lot and I seem to have so much still. This looks very coral-y to me - does it look coral-y to you too? 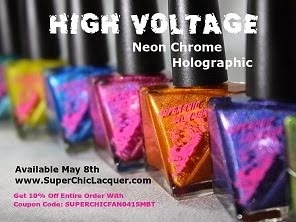 Looking at this mani actually hurts my eyes lol - it's so bright! Ok! That's all I have for today!